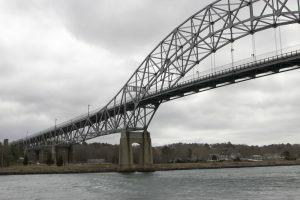 BOURNE – Overnight maintenance work will be conducted on the Bourne Bridge beginning Monday evening. According to the Army Corp of Engineers, the repairs will be made from 8:00 pm on Monday to 5:00 am on Tuesday. During that time, travel lanes on the Bourne Bridge will be reduced to one lane of traffic in each direction. No wide loads will be permitted to cross the bridge when lane restrictions are in place.